We expect to catch fish, harvest crab and shrimp, and eat a lot of seafood between now and fall, but who lives solely on protein?! The galley cabinets and lockers already hold a season's worth of pasta, beans, rice and grains, baking essentials, dried fruit and assorted bottles, cans and packages of all manner of food products. Some of my favorite products aren't available in Canada, certainly not in small communities where groceries arrive by ferry or barge, so I tend to overshop when I can. Now it's time to go shopping, to fill the refrigerator and freezer drawers with fresh food to last for several weeks while we cruise farther north in B.C. Fresh produce, dairy, meats and poultry are next on the shopping list. Provisioning can be an organizational challenge, especially when the fridge already holds too many partially-filled bottles and jars of condiments, small containers of tasty leftovers, odd and ends of produce, etc. While I could toss it all, it's easy to do some creative combining. 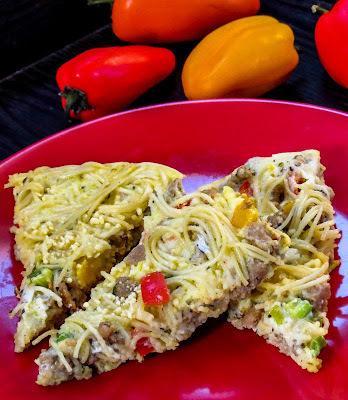 One result is this Tex-Mex Pasta Frittata that combines a ground turkey patty, several mini peppers, a chunk of pepper jack cheese, some previously cooked spaghetti, 1/4 cup salsa, a scant 1/4 cup milk and the last 3 eggs from an 18-pack carton. The resulting stovetop frittata was delicious for dinner, with three skinny wedges left for a breakfast treat. The real bonus here is more shelf space in the refrigerator to store the fresh purchases. Now, about those jars of berry jam, mango chutney, sweet Thai chili sauce, pepperocini, different mustards, etc. that still lurk on the refrigerator door shelves! I foresee sauce experiments coming up soon. Cool, then remove to a large mixing bowl. Add the remaining ingredients to the bowl and toss to blend, coating each strand of pasta with the egg mixture. Reheat the skillet; add the pasta mixture to the pan and press gently to level. Cook, covered, until the bottom is golden brown. Place a large plate over the skillet and carefully turn the skillet over so the frittata rests on the plate. Carefully slide the pie back into the skillet and cook uncovered to brown the second side. Don't overcook or the frittata will turn leathery, never a good thing. Serve wedges from the skillet or slide onto a platter and accompany with sour cream, guacamole or salsa as optional toppings. 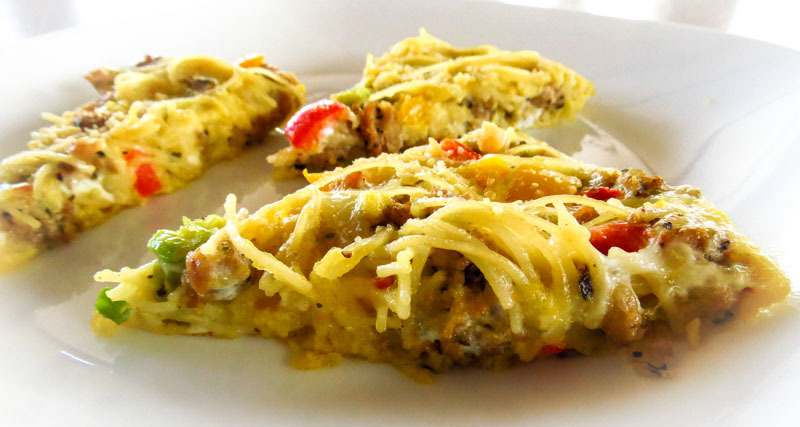 The frittata can be served warm or at room temperature.